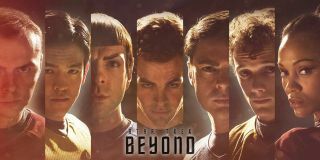 "Star Trek Beyond" (2016) follows the continued adventures of Enterprise crew Kirk, Spock and the rest after 2013's "Star Trek Into Darkness". Note: This article contains minor spoilers for "Star Trek Beyond." "Star Trek Beyond," which premieres today (July 22), opens with a very confusing scenario for Trekkies: A captain of a Federation starship is actually sick of space — enough to want to take a desk job. The last time we saw Capt. James T. Kirk (Chris Pine), in 2013's "Into Darkness," he was breaking Federation rules during his quest to get a coveted five-year mission. Now, he's more than 900 days into that mission, and it's going well. Instead of savoring his achievement, however, he complains about the routine and questions his choice to join Starfleet — which he did on a dare, as he points out to Doctor "Bones" McCoy (Karl Urban). We've seen Enterprise ships go through a lot of abuse over the years, particularly during the "Star Trek" movies of the 1990s. It was modified by the Borg in "Star Trek: First Contact," and it went through a scary crash on the alien planet Veridian III in "Star Trek: Generations." But the plot of "Beyond" — though, thankfully, an original one — soon falls into confusion. It centers on a nasty dude named Krall (Idris Elba) who takes most of the crew captive. The crew is scattered and fighting separate battles against injury, strange beings and artifact hunters. But between the different threads, it's hard to make out what Krall's motivations are for attacking the Enterprise, or why others are helping him. It's OK for "Trek" films to be deep and talk about what the proper role of a crewmember should be on a mission. But when the crewmembers question things in "Beyond," there's too much action surrounding the contemplation to take a breath, so it's hard for the audience to empathize with the characters as they decide where to take their careers next. What saves the movie from a complete distress call, thankfully, is Kirk's wits as he takes a few pages from "The Art of War" and engages in a series of excellent distractions to thwart an enemy against the odds. I'd like to see more of these war games in the next "Star Trek" movie. After all, Kirk's spirit dictates that he should be too busy subduing the enemy to whine — especially when it involves blasting the Beastie Boys. The good: After three movies, the reimagined "Star Trek" is finally confident enough to host its own stories. The bad: Too much plot is jammed into a 2-hour movie, making each of the individual threads hard to understand. The verdict: While the movie is boldly exploring its own adventures, it will be a difficult sell for longtime Trekkies — even with tributes to Leonard Nimoy.